Description: The performance and reliability of F404 engines have set the standard for modern fighter engines. The engine family powers multiple aircraft performing a broad spectrum of missions from low-level attack to high-altitude interceptors. The combat-proven F404 has accumulated more than eight million engine flight hours serving the U.S. Navy, Marines and Air Force, as well as the military forces of Australia, Canada, Finland, Kuwait, Malaysia, Singapore, Spain, Sweden and Switzerland. The list of countries operating the engine will expand in the next decade to include South Korea and South Africa. Description: The baseline F404 was originally designed for the U.S. Navy's F/A-18 Hornet and today is the Navy's most reliable engine. It features modern technology materials, innovative diagnostics, conveniently-placed accessories and a modular design that provides durability and low cost of ownership. The modular design allows for rapid assembly/disassembly, which significantly reduces maintenance time and makes the F404 easy to maintain even aboard ship. Pilots praise the F404's unrestricted throttle movements, fast response and smooth afterburner light-off, calling it a "pilot's engine." Experienced in combat, the F404 has proven to be rugged, reliable and survivable. Description: The F404-GE-402 Enhanced Performance Engine (EPE) provides higher power, improved fuel efficiency and increased mission capability for the F/A-18C/D Hornet. It retains the proven design characteristics of the baseline F404, while achieving increased performance through improved thermodynamic cycle and increased temperature. These performance improvements with no loss in durability were made possible by applying the latest technology and materials to the turbine and afterburner sections of the engine. Description: The F414-GE-400 is the U.S. Navy's newest and most advanced technology production fighter engine. It incorporates advanced technology with the proven design base of its F404 predecessor to provide the Boeing F/A-18E/F Super Hornet with a durable, reliable and easy to maintain engine. The engine entered production in late 1998 after a highly successful Engineering and Manufacturing Development program that was completed on time and on budget. 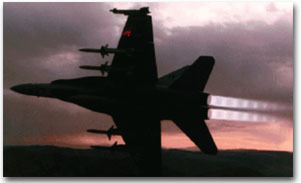 F/A-18E/F Super Hornet production deliveries to the U.S. Navy are in process and are planned to continue through 2012. The F414-GE-400 has been highly reliable during initial field service.